A lot of people talk about critical thinking, but I seldom ever see any explanation of what critical thinking is. Left to our own devices, we might reasonably assume that critical thinking means being critical. That is partially right. 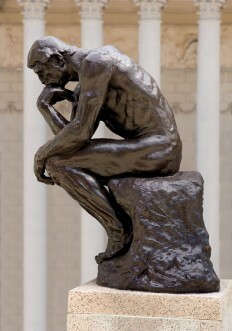 Certainly people who practice critical thinking are often critical of others, but that is not the essence of the term. To me, critical thinking means examining my own thoughts on an issue for errors in logic or reasoning before verbalizing them. It means basing my positions on a foundation of rational thought. It means recognizing bias, especially my own. I’ve written before about bias. When you read a news article or watch a news piece, the reporters and networks pretend they have no bias, but that is absurd. Everyone has a bias – it is inevitable, because even the wisest among us cannot see things from every and all perspectives. The difference between my blog and some others is that I tell you right up front what my bias is. I am pro-freedom, pro-capitalism, pro-individualism, and pro-reason. I am against socialism and any other form of collectivism. My biases are not a result of my upbringing. If anything, my biases are in opposition to the trends and positions espoused to me in school, church, and to some degree, the military. Logic is another key ingredient of critical thinking. Ayn Rand described logic as the art of correct identification. That sounds simple, but it has deep consequences. It is easy for a child to recognize a lemon as a lemon, but it might be a bit harder for the child to understand that the lemon can never be anything other a lemon. It can only do or behave as a lemon. A person might squeeze it to get the juice, or grate it to get the pith, but a lemon cannot become a bird and fly away. Wishful thinking and other logical errors are the source of much conflict and dysfunction in the world. An example: The current brouhaha over gender identity. We are either born with male anatomy or female anatomy (occasions of true androgyny are exceedingly rare). “Identifying” as the opposite gender from what one’s anatomy dictates (no pun intended) is logically erroneous. One might align their conflicted desires to reality via surgery and drugs, but until those procedures are complete, one is “male” or “female” according to one’s anatomy. At the heart of many arguments and conflicts over logic are premises. There is no shortage of pundits, educators, and other influential people that use well-crafted logical arguments that stem from bad premises. Take “equality” for example. We might hear that the difference between conservatives and liberals is that conservatives want people to be treated as equal under the law, while liberals want everyone to have equal outcomes. The first premise rests on the idea that no one is more valuable as a human being than anyone else. It creates the conditions whereby a poor person can raise themselves up from poverty on their own hard work and merit. It is essentially correct, but hard to enforce, because the rich and well connected can sometimes buy better legal representation than the poor. The second premise rests on the idea that it’s not fair for one person to have more than another, so wealth must be redistributed. It gives no attention to the concepts that wealth belongs to whomever created it, or that individuals have any responsibility for their own situation. It is a bad premise, because it ignores the fact that life is not and cannot be fair, and it ignores all of the evidence of human history: Humans cannot rise above animalism without individual effort to devise technology or apply the technology to raising the standard of living. This entry was posted in Money & Wealth, Politics & Philosophy, Reason and tagged Ayn Rand, capitalism, collectiveism, collectivism, conservative, critical thinking, dysfunctional government, fairness, gender identity, individualism, liberal, logic, reason, thinking. Bookmark the permalink.